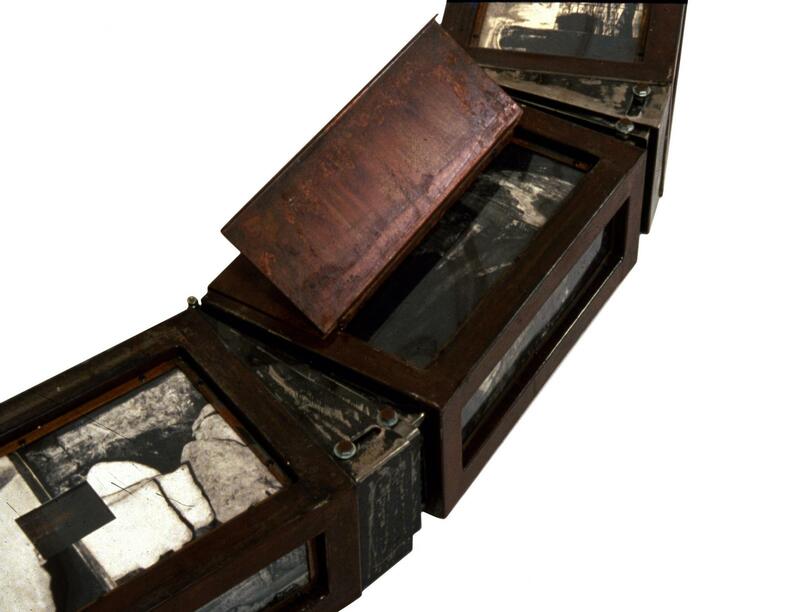 In recent years, the work of Lihie Talmor has been like a progressive conquest of artistic space: from the two-dimensional plane of the etched page, with its illusionary spaces, to the three-dimensionality of boxes and cases, containers of intimate secret spaces; and finally to a total aperture: the work as installation in a real space, where the etchings, the boxes, the solid and the ethereal, become fellow agents in a shared place; where the internal and the external are interlaced so that the personal world of the artist can also be a world for others. Talmor´s work vibrates through echoes, which as such encompass space and time: images that return after their decantation in the collective memory. It's clearest literary reference can be found in the images of Jorge Luis Borges: the tunnel, the aleph, the labyrinth, the garden of working paths, the sand-clock, unfaithful memory, and time unstoppable, which only seemingly fixates on memories already faded and blurred. The gray, the sepia, the white, the incisions in the paper, are like light remnants, saved by the artist, of something irrevocably lost. Now she must capture that something, even if all that is left of it is its shadow or its reflection; she confines it in hermetically sealed iron boxes: boxes made strong against a permanent forgetting, against a cruel time, into which everything vanishes. With these boxes, Talmor marks and limits space, and can thus begin the voyage to the arcane regions. She can thus draw a path for the initiative move towards the depths of the self. "The Andres Perez Mujica Prize"